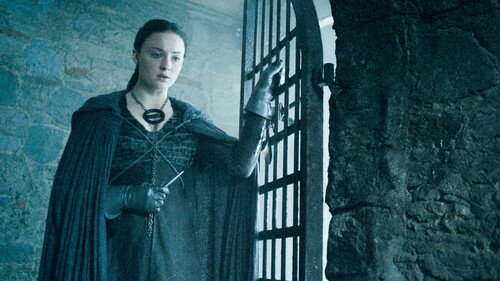 Sansa Stark. . HD Wallpaper and background images in the Sansa Stark club tagged: photo game of thrones season 5 sansa stark. This Sansa Stark photo might contain geschäftsanzug, business-anzug, strafanstalt, strafvollzugsanstalt, justizvollzugsanstalt, strafrechtliche anlage, gefängnis, klirren, knast, poky, pokey, jail, jailhouse, gaol, clink, and slammer.